“Liars, evil beasts, lazy gluttons.” No, I’m not referencing your church members. At least I hope not. This is the description Paul pins on false teachers who are bringing disorder into the church in Crete, the place in which Titus is ministering. These insubordinate teachers are teaching “what they ought not to teach” and leading some in the church away from Paul’s gospel to a type of Judaizer-theology of Jesus plus works. Paul draws attention not only to what they are teaching, but to how they are living. A dichotomy exists between the law-keeping religion they tout and the godless lives they lead. Therefore, Paul is intent on writing to the church in Crete for “their knowledge of the truth, which accords with godliness.” The gospel leads to godliness. Dr. Steven Smith has provided helpful sermon structures and a sermon starter for Titus that are available on Preaching Source. These will assist you in discerning the organization of the epistle and identifying the focus of specific texts. 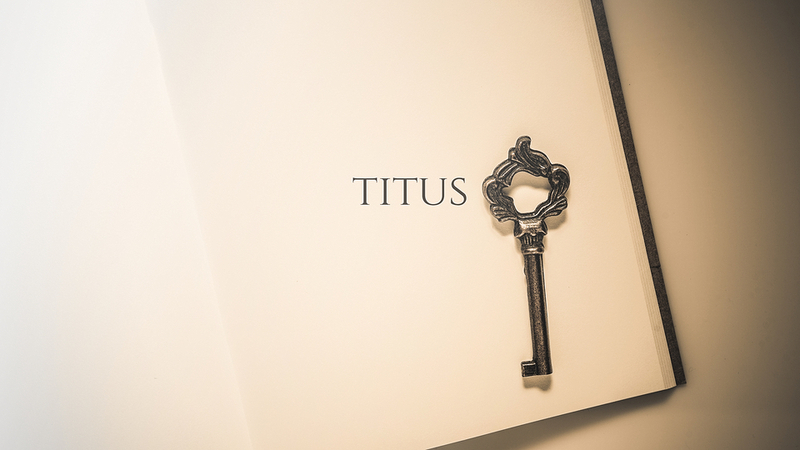 My desire is to offer some suggestions to keep in mind as you consider preaching the book of Titus. Don’t Avoid It; Preach It! The above summary of the situation in Crete highlights a main theme of Titus, which is the connection between orthodoxy and orthopraxis. While this letter bears special significance for church leaders, it should not be reserved for seminary students or church staff. The epistle is for the church. It provides a picture of the type of pastors and elders that the church should look for, and the type of men that they will set before themselves as examples in Christian conduct. In addition, the qualifications for overseers should be true of all believers. And maybe God will use the preaching of Titus to call men from your church into ministry! Titus contains much practical instruction. However, the practical instruction is anchored in gospel truth. The epistle rides on two textual axles found in Titus 2:11–15 and Titus 3:3–7. These two epicenters anchor the epistle in Christology and soteriology. Remove the axles from a car, and you will have to tow it to where you want it to go, no matter how good it looks. Remove the anchor from a boat, and it will drift to where you do not want it to go. How do we preach the do’s and do-not’s of Titus alongside these doctrinal anchors? Paul doesn’t provide Titus with a practical checklist for a successful church apart from Jesus and the salvation he brings. We need to keep in mind that Paul places his push for godliness and maturation in its historical and theological context. The exhortations are situated between two appearings: the appearing of grace and the appearing of glory. We must preach each portion of the text from grace toward glory. To preach from grace, our preaching must exalt Jesus. The first appearing Paul mentions is the appearing of grace that brings salvation for all people (2:11). Paul speaks of the tangible manifestation of God’s grace in the person and work of Jesus Christ. His incarnation, life, death, resurrection, and ascension explain the substance of that grace. Grace drives the Christian life, gospel-less guilt drowns it. It is God’s grace that trains us to reject the flesh and pursue Spirit-filled living, not finger-wagging at bad behavior. To preach from grace means that our preaching is necessarily grounded in and centered on Jesus. We stand each week preaching from the historic appearing of grace in Jesus Christ and finished work. To preach from grace, we should connect ethical exhortation to God’s grace revealed in Christ. We know Paul’s letters to churches often have two main divisions: theology first, then application. In Preaching the Whole Bible as Christian Scripture, Goldsworthy states, “Sunday sermons on epistles are often divided up into several week series. The result is that the ‘application’ bit of the epistles can be weeks removed from the ‘gospel exposition’ of the first chapters and be presented as ‘naked law’” (xiv). This neat division is not present in Titus, but the temptation to preach behavior apart from belief still exists as we exposit individual preaching texts. We must remember that the grace of God undergirds every command of God. Even the list of qualifications for elders describes men who have been transformed by God’s grace revealed in Jesus’s first appearing and are living in light of Jesus’s second appearing. Christ-exalting preaching tethers us to a grace-driven ministry of the Word. To preach toward glory, we must demonstrate that the gospel demands life change. The second appearing that Paul mentions is the appearing of the glory of Jesus Christ (2:14). Why is Paul intent on silencing the gospel’s detractors, rebuking those who are straying from his gospel, and correcting unchristian conduct? Because Christ’s Parousia supplies him with a sense of urgency. The Second Coming fuels evangelism, but it also fuels edification. Do not be afraid of drawing strong rebuke or specific ethical application from the text for fear of no longer being a “grace guy.” Rebuking and exhorting are more gracious than allowing people to remain in sin and false belief. The goal of Paul’s rebuke is that “they may be sound in the faith” (1:13). Rebuke should be restorative and redemptive. Remember, the gospel is the ground and means of rebuke. To preach toward glory, we must preach sound doctrine. Because of our desire to promote life change, a temptation exists to emphasize what is practical. To be sure, if we do not demonstrate the significance of the text for the real, everyday life of believers, we have not yet preached. However, in the face of godless living, Paul charged Titus to teach what accords with sound doctrine. Theology! The supposed chasm between theology and practical matters is not as wide as it may seem; in fact, they are inextricably connected. Doctrine affects deeds. What God has brought together, let not the preacher separate! Jesse Welliver serves as pastoral research assistant at Eagle’s Landing First Baptist Church in McDonough, GA. He earned his Master of Divinity from Southeastern Baptist Theological Seminary, where he is pursuing a PhD in Preaching. He is married to Rachel, and they have two daughters.